Simplify your social posting with cross-network publishing, scheduling and analytics. Connect your Facebook, Twitter, Instagram, Pinterest and LinkedIn accounts and post across different social networks from a single tab. Schedule your Facebook, Twitter, LinkedIn, Pinterest and Instagram posts weeks in advance. 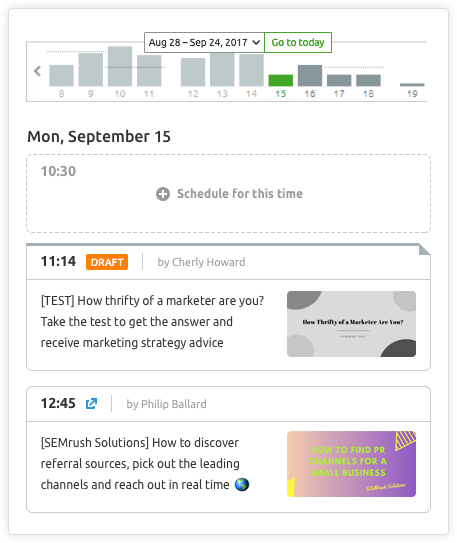 Choose from multiple scheduling options: publish now, schedule for later, multi-schedule selected posts repeatedly at different times or save them as drafts. Create a custom posting schedule for your social networks, and let the tool send your posts to empty time slots. Get automatic suggestions on the best times to post based on when your fans are most active. Set your posting objectives (the number of posts per day) and monitor your progress. View your scheduled posts in a list or in a calendar to quickly spot gaps and overlaps. Easily move your posts to another time or date using the ‘Drag and Drop’ feature. Edit your images before posting with a built-in photo editor. Add UTM parameters and shorten your links right in the posting wizard. Connect RSS feeds from your favorite blogs and share with your audience using the ‘Content Ideas’ feature. Share any calendar you create with your team. Use handy hotkeys to save even more time while you work! Hold down the ‘Alt’ key to see a full list of hotkeys available. Now there's no need for you to go to your Facebook page several times a day to track new likes, shares, audience growth, and other engagement metrics. The ‘Analytics’ tab will provide you with a quick analysis of your page’s performance in one easy-to-read table. Post any article or mention across all your social media accounts with one click. Just like in the tool itself, you will have the option of posting immediately, scheduling for later, or saving your post as a draft. Schedule retweets for any time you want, add them to your queue, and multi-schedule those that will stay relevant for some time.